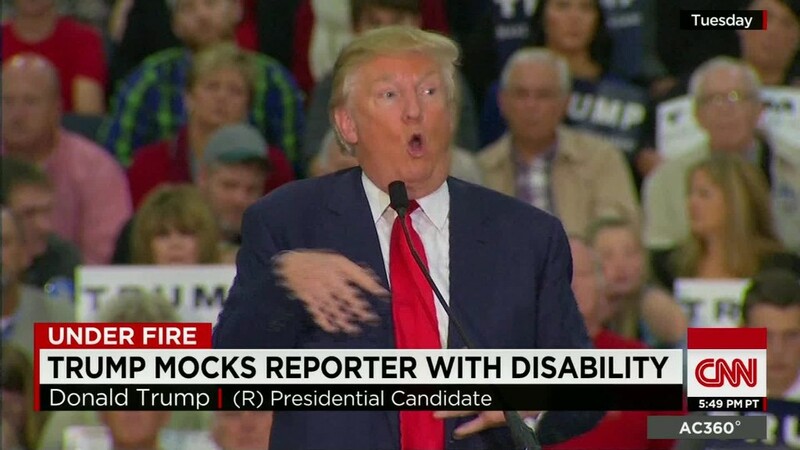 Trump accused the reporter of "using his disability to grandstand." Trump waved his arms in an awkward manner at a rally in South Carolina Tuesday night while talking about a comment made by Serge Kovaleski. Kovaleski has a chronic condition called arthrogryposis, which limits the movement of his arms. The New York Times was offended. "We find it's outrageous that he would ridicule the appearance of one of our reporters," a spokesperson told CNNMoney. Kovaleski, who had previously worked at the Washington Post and the New York Daily News, had covered Trump many times in New York. Trump, however, said he did not know Kovaleski. "I have no idea who this reporter, Serge Kovalski (sic) is, what he looks like or his level of intelligence," Trump said in a statement. "Somebody at the financially failing and totally biased New York Times said that, over the years, I have met Mr. Kovaleski. Despite having one of the all-time great memories I certainly do not remember him," the candidate added. Trump said that in his speech at the rally "I merely mimicked what I thought would be a flustered reporter trying to get out of a statement he made long ago. If Mr. Kovaleski is handicapped, I would not know because I do not know what he looks like. If I did know, I would definitely not say anything about his appearance." In a subsequent statement, Trump demanded an apology from the New York Times and was critical of Kovaleski. "Serge Kovaleski must think a lot of himself if he thinks I remember him from decades ago -- if I ever met him at all, which I doubt I did. "He should stop using his disability to grandstand and get back to reporting for a newspaper that is rapidly going down the tubes," Trump said. Trump's performance at the rally was prompted by challenges to Trump's repeated claim that he saw "thousands" of Muslims celebrating in Jersey City, N.J., as the World Trade Center towers burned and fell during the 9/11 terror attack. Both sides have cited a story Kovaleski had written in 2001 when he worked for the Washington Post that said authorities had detained "a number of people" in Jersey City who had allegedly been seen celebrating the 9/11 terror attacks on the World Trade Center. Kovaleski's story referred to FBI probes of the alleged celebrations, but quoted no witnesses and contained no specific evidence that celebrations occurred. He was interviewed this week by the Washington Post about his 2001 reporting. "I certainly do not remember anyone saying that thousands or even hundreds of people were celebrating. That was not the case, as best as I can remember," Kovaleski told the Post. During Trump's Tuesday night speech, he used an exaggerated voice and arm actions as he pretended to be Kovaleski. "Now the poor guy, you've got to see this guy: 'Uhh, I don't know what I said. I don't remember.' He's going, 'I don't remember. Maybe that's what I said,' " Trump said. Shortly before Trump issued his denial, the Ruderman Family Foundation, which advocates for the disabled, said it was "unacceptable" to have a "presidential candidate mocking someone's disability as part of a national political discourse." Jay Ruderman, president of the foundation, offered to provide sensitivity training to Trump and urged the candidate to apologize to Kovaleski. Trump has frequently attacked reporters who have displeased him during his presidential campaign. One of his targets has been Fox host Megyn Kelly who angered Trump with her questions during the first GOP debate on Fox. He has ridiculed Kelly and her show. He has also attacked conservative commentators including Hugh Hewitt, Glenn Beck, Erick Erickson, Charles Krauthammer and George Will. His descriptions have ranged from "total dope" to "loser." Editors Note: this story has been updated to more accurately reflect the reporting in the original 2001 Washington Post story, which referred to "people allegedly seen celebrating."